rugby and not quite rusted root. Also, I need to share more Boh ridiculousness with you. 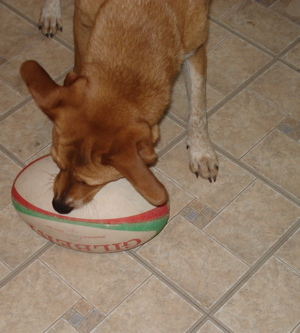 I brought in the rugby ball bag this weekend, and yesterday he became very interested in the contents. I got out a ball and he alternately chased it and ran away from it for a good 45 minutes. More affirmation that he really is MY dog. I took a pretty funny camera video, but I don’t see the format supported here in WordPress, so I’ll just share an image and leave the goofiness to your imagination.